And of course, the school colors of yellow and blue. I thought it was only appropriate to start of this blog post about my sister in law’s wedding with a piece of my matron of honor speech. 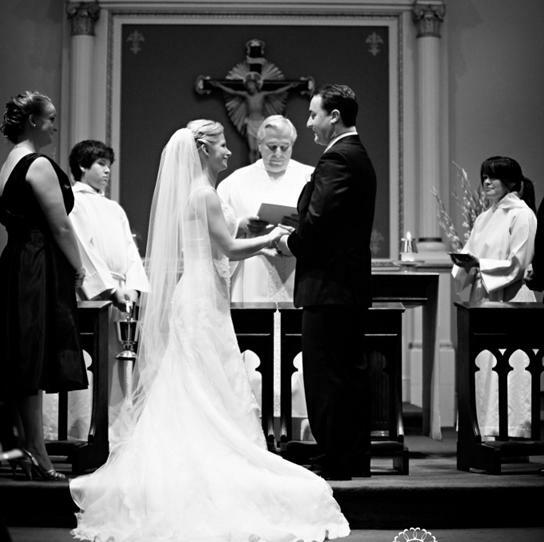 It was very different experience, indeed, planning a wedding for a family member; an event in which I was more than personally vested - an emotional involvement that can only be described as similar to the way I felt about my own wedding. 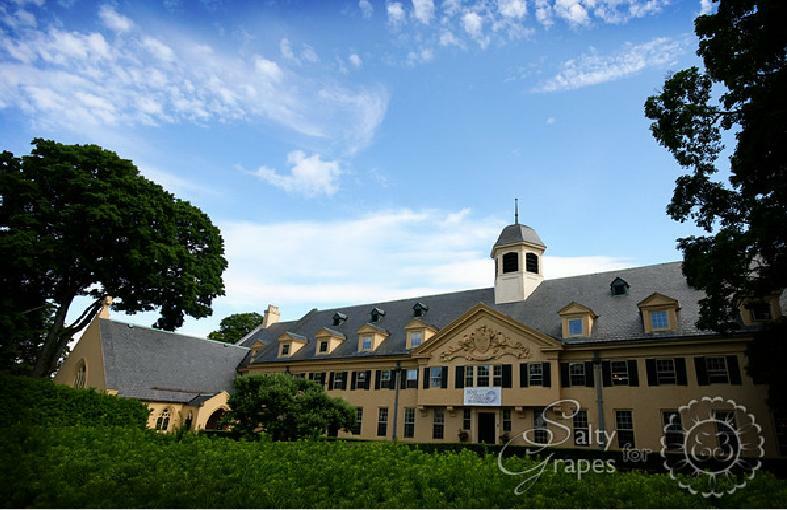 Even before they were engaged, it was always Shelby’s dream to be married at Westover School in Middlebury, Connecticut, where her blood runs deep. My father in law has worked there for over 25 years, she attended school herself, and since college has returned to hold a number of positions and now resides on campus. Ryan and Shelby envisioned a late spring country wedding with a bit of panache, and we carried the yellow and blue theme throughout. With an exceptionally large guest list in a rambling, unique space we had to be creative, but the end result was awesome and everyone is still raving about what an incredible day it was. All photos courtesy of Eileen Broderick , assisted by Julia of Salty Grapes Photography. 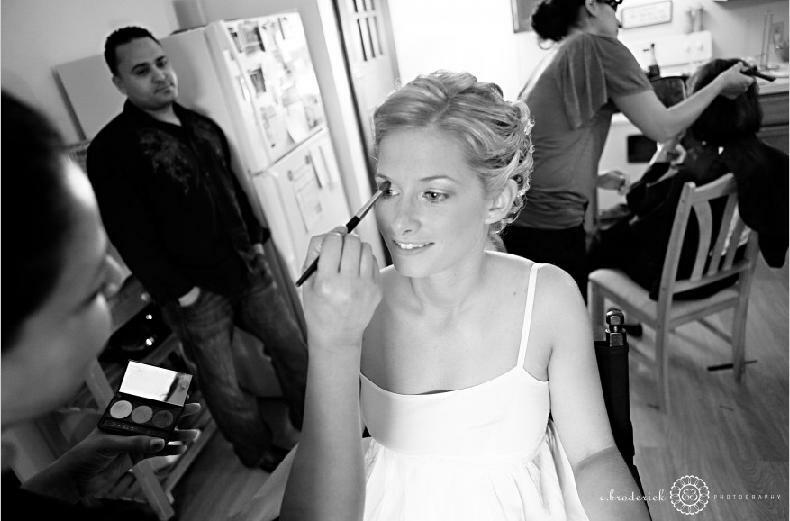 Both were so wonderfully sweet to work with and really told the story of Shelby and Ryan’s day. Thank you both! Early morning preps began in Shelby’s dorm apartment by the ever so fabulous Naomi Martinez and Angela from Naomi’s Studio & Salon of West Hartford. 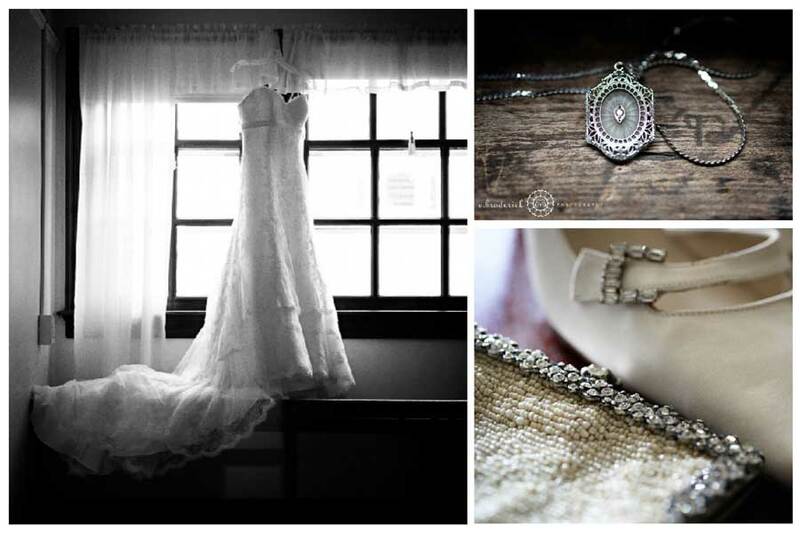 Shelby donned a Bellisima "Chloe" lace dress with a custom band and skirt alteration from Mariella Creations. As luck would have it, we are similar in size and thus, she she also wore my Fenaroli veil and Vera Wang for Stuart Weitzman shoes (Ebay, baby!) and carried my beaded clutch as her something borrowed and her grandmother’s necklace as her something old. We went downstairs into one of the libraries for her to put on her dress, and during this time Ryan sent over a gorgeous diamond and sapphire bracelet. Jane of Just For You provided the bridal party and ceremony flowers. 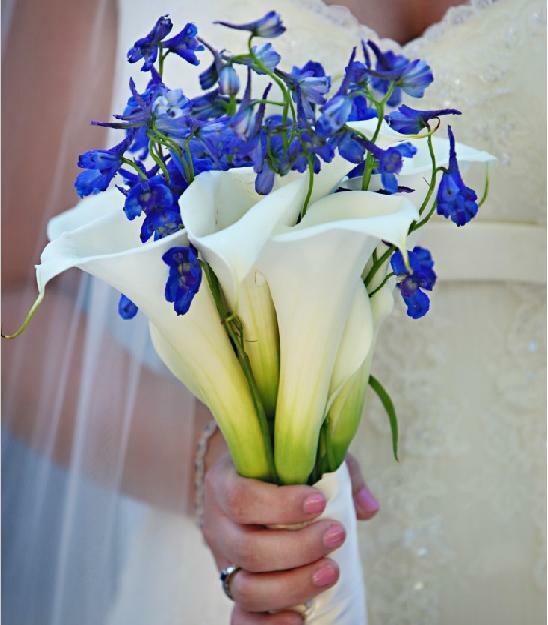 Shelby carried a beefy calla bouquet with blue delphinium. Then it was time for bridal party photos outside. 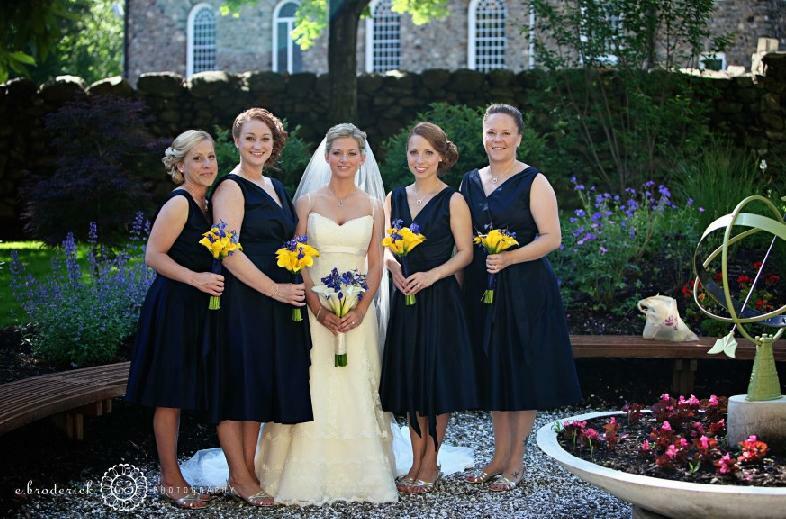 The maids wore metallic navy dresses from Jim Hjelm Occasions and Nine West shoes, along with jewelry and yellow clutches Shelby gave to us as gifts. We carried yellow calla bouquets. Flower girl Hannah in a dress from Target (yes, target! ), customized with a sash from the maids extra fabric and my little chap Landon, head to toe in Janie and Jack (love that store). 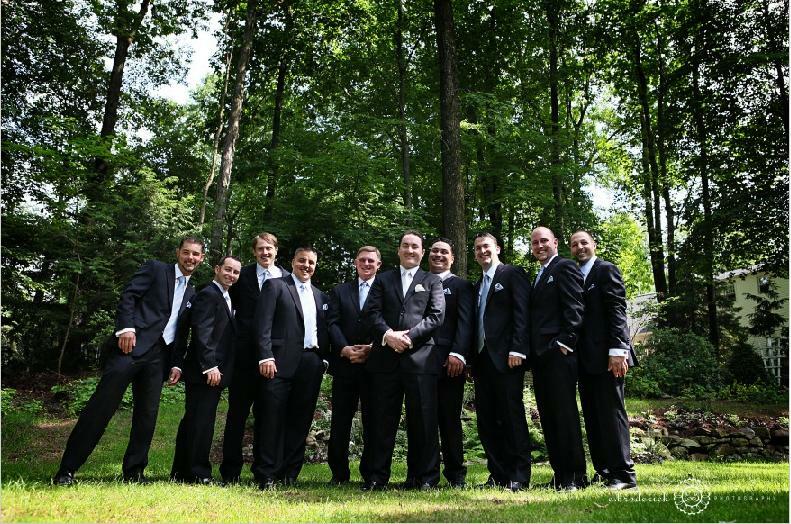 The guys wore custom navy suits from Antonio’s in Waterbury and looked dapper, indeed. Ryan’s father was his best man, so touching. My husband (the shorty) and his two brothers are on the left of the photo. 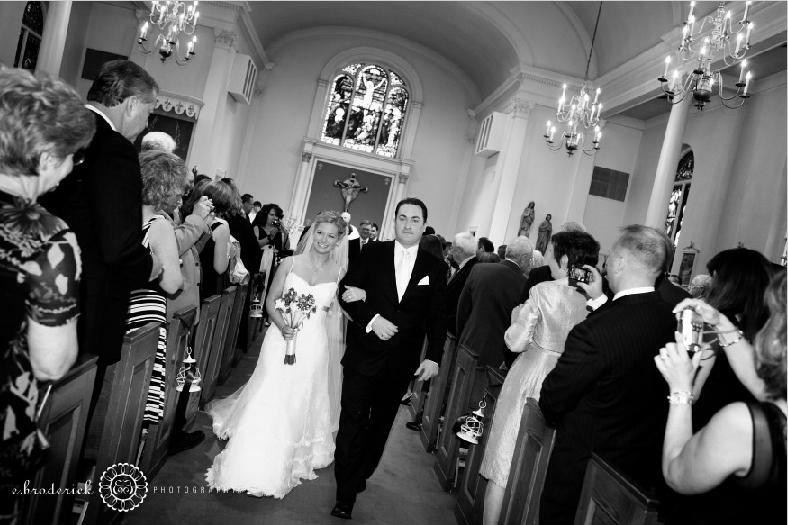 The ceremony took place at Saint John of the Cross, just a few steps from Westover. The church was decorated with two yellow glad arrangements and the pews were tied with lanterns, a nod to Westover’s signature symbol. With a kiss and lots of applause they were married at last! Guests walked from the church across the street to Westover's Senior Garden where Emily’s Catering put on the most fantastic spread, and were waiting with glasses of wine. 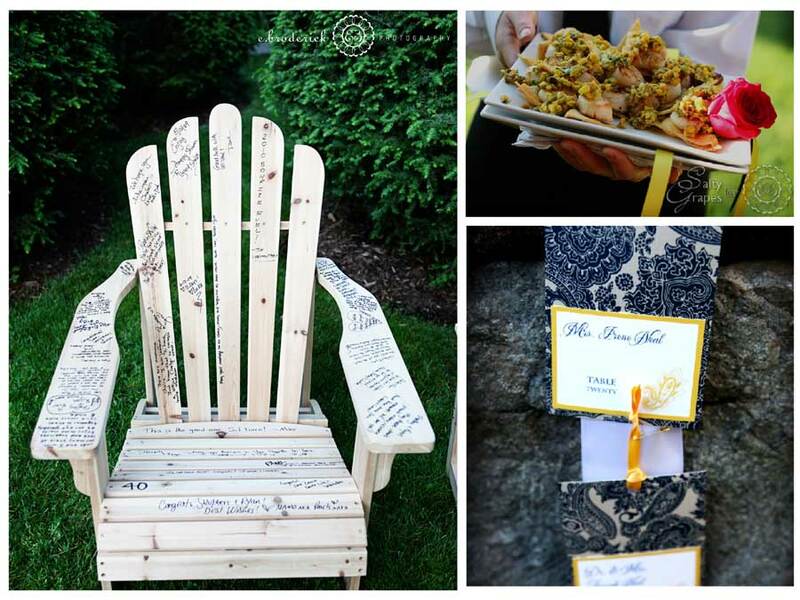 The first thing guests saw was the two Adirondack chairs guest book, along with place cards along the old stone wall on a wide ribbon. All paper designed by Talia of Sixpence For Your Shoe. Inside in the dining hall, we swapped the original ladder-back chairs for white chivari. 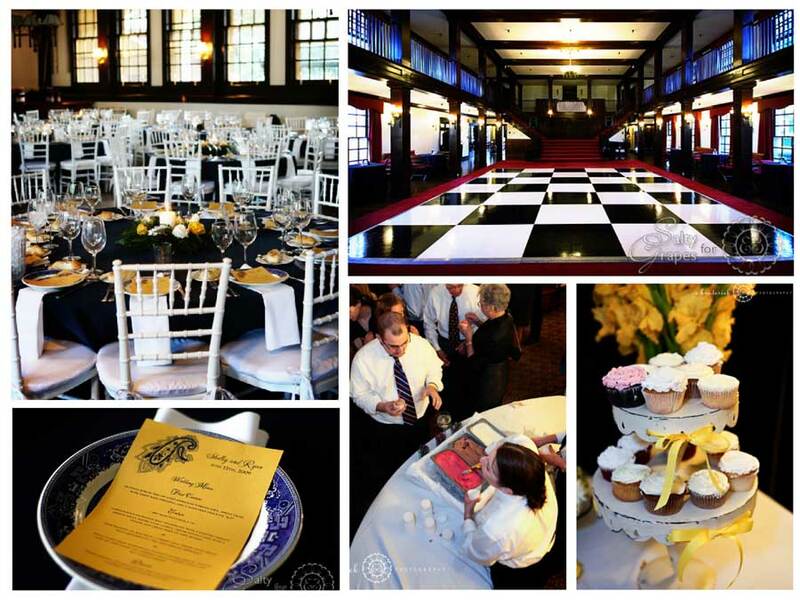 Tables were dressed with navy linens, white folded napkins and Westover’s own Spode china. All rentals were through Durants Tents and Events. Table numbers and menus complimented the original stationary suite. The candle centerpieces were provided by a local florist. Dinner commenced with a trio of cold heirloom tomato soup, spring salad with sweet basil dressing and a miniature pancetta BLT, followed by a choice of gorgonzolla encrusted beef tenderloin with a roasted shallot merlot, herb roasted sea bass with a cherry salsa or spinach & fresh motzarella stuffed chicken breast. Desserts consisted of cupcakes from Edible Dreams, Italian cookies from Shelby’s grandmother and a gelato bar via Gelato Guiliana. We had originally planned to dance outside, but with the iffy weather, the dance floor was set up on Red Hall. Our back-up plan worked out well as it made a great statement in the space. 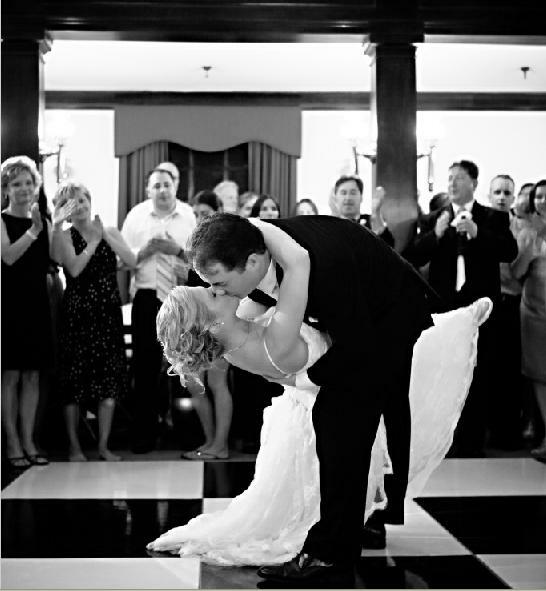 Following dinner, Shelby and Ryan danced their first dance to “Everything" by Michael Buble. 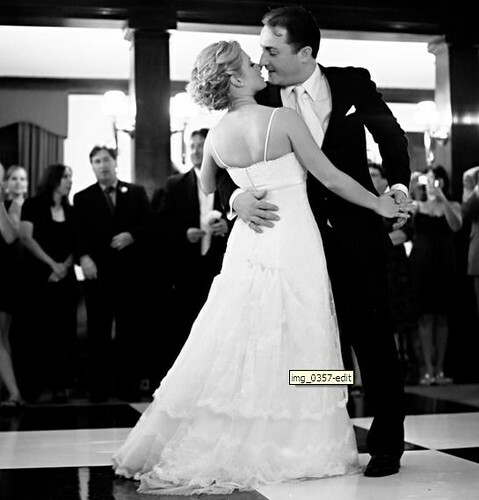 This couple had no need for dance lessons, they floated like they were on air. Guests danced until 2am to tunes of all kinds. DJ Rob Waldron from Standing Ovations kept the dance floor packaged for 4 hours straight. Shelby and Ryan, it has been my honor and privilege to be part of your engagement, as well as your wedding from start to finish. It was an absolute blast sharing in the anticipation and excitement of your engagement to the very last detail of your wedding. I need not wish you happines, because I know you have it.